Startups seem to be popping up everywhere. But recent reports show that startup creation is actually on the decline. According to data from the U.S. Census Bureau, the number of new firms introduced relative to all firms fell from 16.5% in 1977 to about 8% in 2013. Many startups fail because they don’t have enough funding to get off the ground. Luckily, there are U.S. cities where launching a startup doesn’t have to cost a fortune. 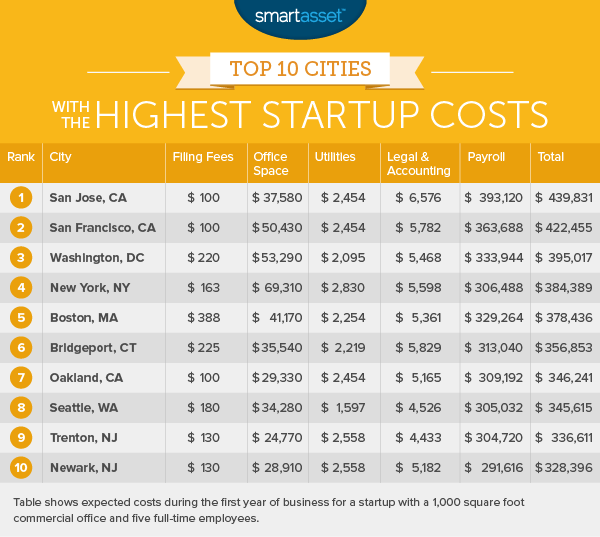 This is SmartAsset’s second annual study of the cities with the lowest startup costs. Check out the 2015 study here. 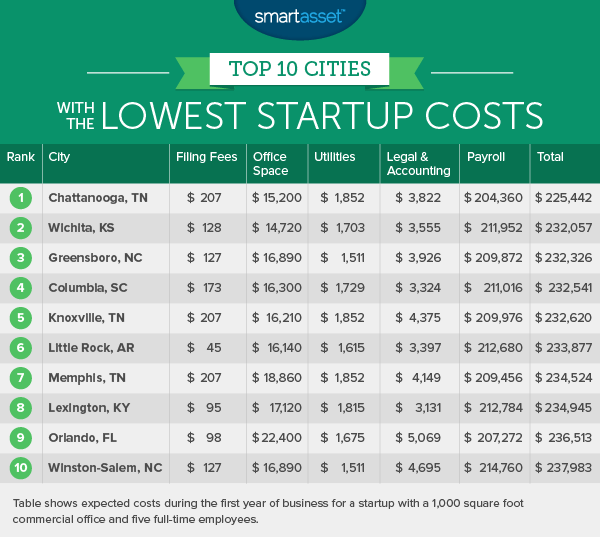 To find the cities with the lowest startup costs, SmartAsset looked at 80 of the largest U.S. cities. We ranked each city after adding up the costs that a new company would cover in its first year of operation, including filing fees, legal and accounting fees, payroll costs and the cost of utilities. The expenses that we considered in our analysis were the same ones that we used in our 2015 study. Our calculations are based on the cost of running a business with five employees and leasing out a 1,000 square foot office space. Note that the total startup costs are not averages, but rather a comparison of what it would cost to operate a generic business in each of the cities in our study (based on assumptions that do not necessarily apply to every startup). Also, note that the number of cities that we could use in our study was limited by the availability of data on legal fees and office lease rates. You can read more about our methodology below. Try out SmartAsset’s free investment calculator. Tennessee takes the cake. The Volunteer State is home to three of the top 10 cities with the lowest startup costs. Stay away from big cities. The largest U.S. cities are expensive places to live and start a business. While you may have access to a bigger network and more resources, you’ll need to be willing to pay the price if you want to launch a startup somewhere like Washington, D.C. or New York City. Chattanooga ranks as the U.S. city with the lowest startup costs for the second consecutive year. We found that it would cost just $225,442 for a business owner with five employees and a 1,000 square foot office to run a first-year startup there. If you decide to start a business in the Gig City, you’ll be in good company. Many startups and accelerators operate there, including the Lamp Post Group and Gigtank 365. Each year, entrepreneurs in Chattanooga come together to celebrate Startup Week and host events that showcase what businesses are doing in the community. Out of the 80 cities in our study, Wichita is the cheapest place to lease a 1,000 square foot office. A one-year lease would cost $14,720, on average. Entrepreneurs who want to launch startups in Wichita don’t have to do it all on their own. 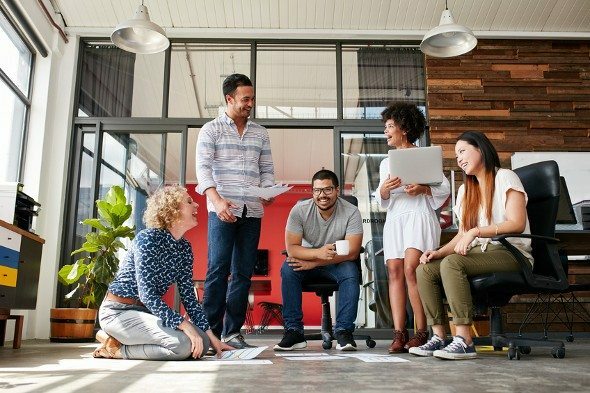 They have a number of resources to tap into like Startup Wichita, which connects startup founders and people working in the tech industry. In our 2015 study, we found that Greensboro was the eighth city with the lowest startup costs. If you’re interested in turning your startup idea into a corporation, there’s good news. Corporations in North Carolina have a lower tax burden than their counterparts in other states across the country. In September 2015, the state changed its corporate income tax rate from 5% to 4%. Entrepreneurs looking for top talent might have to compete with quite a few Fortune 500 companies with major operations in the Greensboro, including AT&T, Procter & Gamble and Citigroup. Columbia could be a great place to set up a business if you want to hire recent graduates. In this city, you’ll be surrounded by plenty of college campuses including Columbia College, Columbia International University and the University of South Carolina’s flagship campus. In its first year in business, a company with five employees and a 1,000 square foot office can expect to spend a total of $232,541. That’s 5.3% lower than what it would cost to start that same company in Charleston, South Carolina. Related Article: What is the Cost of Living in South Carolina? A Knoxville business owner with a 1,000 square foot office would spend $1,852 on gas and electricity in his or her initial year of operation. That’s 1.4% lower than the national average. Legal and accounting fees might be a bit steep ($4,375), but you can save money on the office you’ll be leasing out. On average, a 1,000 square foot office in Knoxville costs $16,210 per year. That is the fifth lowest commercial real estate rate in our study. Entrepreneurs in central Arkansas have managed to form their own close-knit community. They link up with each other through an alliance known as Startup Arkansas and attend events like the annual Little Rock Tech Fest. Startups who need extra funding and support can try to get help from accelerators such as Innovate Arkansas, the Venture Center and the ARK Challenge. The startup scene in Memphis is beginning to boom. New businesses from around the country and even outside of the U.S. have moved to the Birthplace of Rock and Roll. Of course, that’s no surprise since Memphis has historically served as a place where business leaders have thrived. Six Fortune 1000 companies, including FedEx, have headquarters in the city. Business filing fees in Lexington are relatively low. You would only need to pay $95, on average, to file as an LLC or a corporation. Legal and accounting costs are also lower here than they are in any other city in our analysis. Small businesses who choose to move to Kentucky or expand there might be able to take advantage of some of the incentives offered by its economic development finance authority, like tax credits. Orlando is an affordable place to travel and also to launch a startup. According to numbeo.com, its cost of living is about 25% lower than the cost of living in New York City. NYC is the fourth most expensive place in our study to start a business. Compared to the national average, the total cost of operating a new business in Orlando with five employees working in a 1,000 square foot office is 16.1% lower (when looking at the 80 cities in our analysis). Winston-Salem has a population of about 234,469 people, according to the 2014 American Community Survey produced by the U.S. Census Bureau. Based on our calculations, we found that setting up a business in this city is significantly cheaper (12.7% lower) than starting a company in Raleigh, the capital of North Carolina. Major industries in Winston-Salem include healthcare, education, manufacturing and financial services. That means that startups with products and services related to these kinds of businesses would fit in nicely with the city’s existing companies. In addition to finding the cities with the lowest startup costs, we wanted to figure out which cities had the highest barriers to entry for entrepreneurs from a financial standpoint. All 10 of the places with the highest startup costs in 2015 are the most expensive places to launch a business in 2016. But that shouldn’t necessarily discourage you from starting a company in any of these places. After all, many of the startups that have become household names are headquartered there. There’s also something to be said for the talent pools in these areas. In order to create our ranking of the cities with the lowest (and highest) startup costs, we made several assumptions. We assumed that a new startup would need a 1,000 square foot office, so we pulled the average cost of leasing an office that size in all 80 cities. Then, we calculated the average cost of providing electricity and gas for a 1,000 square foot office in each city using regional consumption rates and state-level energy rates from the Energy Information Administration. Assuming that a startup would have five full-time employees on its payroll, we calculated the cost of paying each of these workers the median annual salary (using city-level data from the Bureau of Labor Statistics). We also assumed that a business would pay $1,000 for accounting fees and $3,500 for legal fees, on average, in its first year. We calculated the cost of those fees in each city by dividing those amounts by accountants’ and lawyers’ national average wages and multiplying those figures by local hourly wages. Finally, we looked at licensing fees for LLCs and corporations and took the average of both types of fees. We combined all of our operating expenses to find the total cost of running a startup in its first year of business. Then, we ranked all 80 cities based on their individual totals. Data on licensing fees comes from bizfilings.com. Data on legal and accounting costs comes from the BLS. Reis, Inc., a company that provides commercial real estate data, emailed us the office lease rates that we used in our analysis.